Scientists have to be prepared for DANGER! 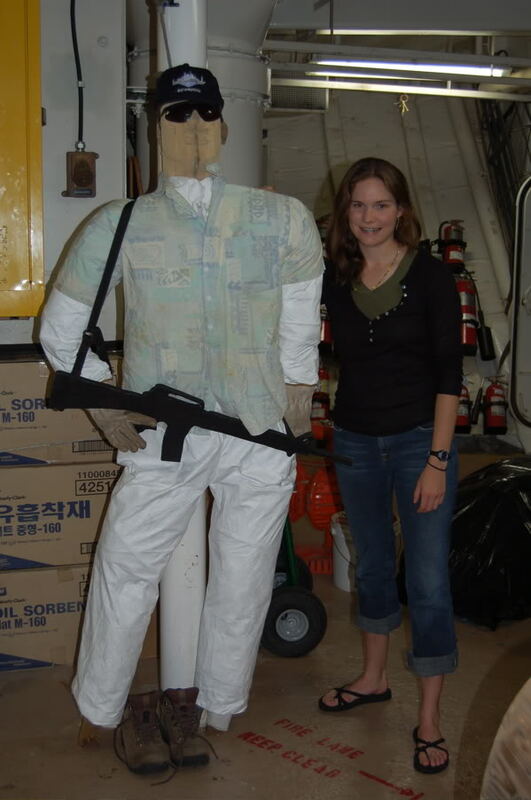 This is a photograph of my daughter, now Dr.Daughter, and her “pirate defense” dummy. My daughter while in graduate school was part of a scientific cruise out of Woods Hole MA. The cruise was to the Indian Ocean, and there is a good site, meant to teach and inspire students, about it here. Many people think scientists spend their days in labs, thinking and working with test tubes. However, there is a lot of danger in being a scientist. Scientists need to go to where the science is. It’s not often found in a comfortable armchair in a 5 star hotel. While there were many dangers during this cruise, including a rogue wave that almost washed several scientist overboard, the most frightening to me as a mother was the pirate danger. My daughter I am sure kept much of the “pirate” information away from me. However, she did admit at night the pirates, in small fast boats, like to run near the ship to “test” if it was well defended or not. The scientists built these dummies, in the hopes of making the ship seem better defended. The real defense for the boat was the ex-Navy crew, who I suspect were rather amused by the scientists attempts to fool the pirates. My daughter, now working in private industry, still travels to areas of great danger in the name of science. One of her favorite places to travel, and study, is the Middle East. She’s fairly fluent in Arabic, and enjoys the culture and the challenge of working there. She did her work for the PhD thesis in Oman, still one of her favorite places. As for the pirate danger, it may have been the dummies or it may have been the experienced crew, but the ship made it safely to port. My daughter however lost her heart to a fellow scientist on board, and is now married to him. They continue their adventures as a married couple, not ready to spend all their time in a lab, yet. One of the best things about being a scientist, is that you get to go to all sorts of interesting, exotic, and yes dangerous places, and someone pays you to go there. Being a scientist can be very cool, dare I say even cooler than being a pirate! Follow my daughters adventures at her blog HERE. For another danger besides pirates…click HERE.